A total of 100 limited units of the new Ford Freestyle compact cross-hatch can be pre-booked via Amazon India at 2pm on April 14. The Ford Freestyle will open pre-bookings to customers on Amazon India on April 14, ahead of its launch on April 18. A total of 100 units of the compact utility vehicle by Ford India will be up for pre-bookings on Amazon India, and the bookings will commence from 2pm on April 14, Saturday. The online pre-booking of the car will be exclusive only to Amazon India, and customers who pre-book via Amazon will be among the very first to receive deliveries of the car. 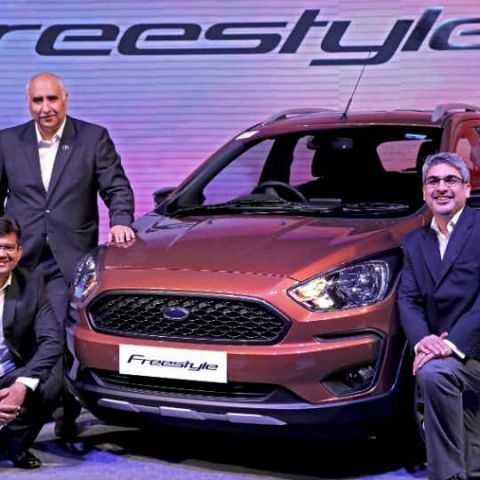 The Ford Freestyle falls in the growing cross-hatch category, and will be placed between the Figo hatchback and the EcoSport SUV when it launches in India. The car comes with a segment-first active rollover prevention to provide a more rugged quality of handling, and also come with a redesigned dashboard and the Ford SYNC 3 infotainment system. For more details, click here. NEW DELHI, India, April 12, 2018 – Customers waiting to own the cool, capable & connected Ford Freestyle can skip the queue and book India’s first compact utility vehicle, exclusively on www.amazon.in. The exclusive 24-hour booking window on Amazon India will start at 2:00 PM on April 14 and enable 100 customers to be amongst the first few to drive home the Ford Freestyle. Amazon has setup dedicated brand page for Ford Freestyle, www.amazon.in/freestyle, to help consumers select their preferred variant, engine option and colour. Customers can book their Ford Freestyle by paying INR10,000 via payment options available on the dedicated brand page or through Amazon mobile application. Ford Freestyle, the latest global product from Ford, combines SUV-like robust design, benchmark performance, innovative technologies and outstanding fuel efficiency. The vehicle looks modern, aggressive, inviting and ready for action, whether on or off-road. Interiors have been designed to convey the same sense of sportiness, featuring smart, dual tone interiors and the quietest cabin in its segment. Customers will be able to choose from Ford Freestyle’s outstanding engines – an all-new, three-cylinder 1.2L TiVCT petrol engine that generates best-in-class 96 PS of peak power and 120 Nm of torque and Ford’s trusted 1.5L TDCi diesel engine that generates class-leading 100 PS peak power and 215 Nm of torque. The CUV will introduce segment-first Active Rollover Prevention (ARP) technology that helps prevent any potential rollover situations. The Freestyle will continue Ford’s leadership on safety, offering standard dual airbags and up to six airbags on top Titanium+ trim. The Freestyle will feature Ford’s award winning in-car technology, SYNC 3 with a 6.5-inch touchscreen that allows drivers to control their entertainment and their connected smartphone through voice commands. It is also Apple CarPlay and Android Auto compatible. Xiaomi event to be posted on youtube ? Can rooting be done on android tabs?